Underwood Family Farms is working to do our part to help the environment. All of our promotional materials are printed on post-consumer recycled paper and we do our best to minimize waste both in our offices and in the field. This past month, we implemented a recycling program at our Moorpark and Somis locations. In addition to the grass Bolga Baskets that we sell at both of our Farm Markets, we also have re-useable red shopping bags with our logo and our motto "Growing Green." By supporting your local farmer, you are doing your part to help the environment. As written in June 2007 Better Homes and Gardens, typical grocery store produce travels nearly 1,500 miles before it reaches your home. Traveling burns fossil fuels and as a result carbons are emitted which translates to pollution. 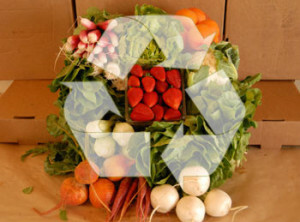 Buying from your local farmer either at a Roadside Market or a Farmers' Markets, not only means you are getting the freshest produce around, but also that you are helping to save energy. Check back soon to find out more ways Underwood Family Farms is helping to save our environment.